“Hippie” is not among the descriptors most would use the first time they meet Wasatch Beers and Brew Pub founder Greg Schirf. Dressed in khakis, a white button-down shirt, and loafers, his snowy hair shorn well above his ears, Schirf looks more like someone’s dad than a flower child. He is, in fact, a proud father; his son JG started college in British Columbia last fall. (“Being raised in Utah, he was ready for an adventure,” Schirf says.) And if asked, he presents himself as a “reformed hippie.” But here in Park City and across the state, Schirf holds a slightly more notorious distinction: godfather of beer. Around the same time, Schirf received an invitation for lunch from Peter Cole and Jeff Polychronis, two fellow Parkites he’d worked with in real estate prior to turning his attention to brewing. The pair announced that they, too, were joining the microbrewery fray. The inaugural Squatters Brew Pub opened in Salt Lake in 1989, the city’s first since 1967. 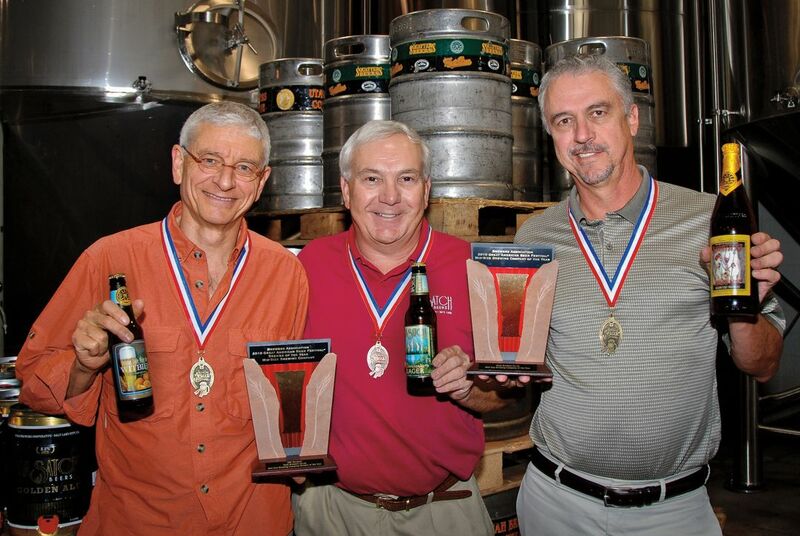 Left to right: Peter Cole, Greg Schirf, and Jeff Polychronis show off Utah Brewers Collective accolades garnered at the 2010 Brewers Association Awards. From then on, Schirf, Cole, and Polychronis supported one another’s endeavors, building a professional relationship on the premise that a high tide floats all ships. In 2000, Squatters Craft Beers and Wasatch Beers made their chummy association official, forming the Utah Brewers Cooperative, a partnership now responsible for 28 different beers. In 2012, the Utah Brewers Cooperative was purchased by Boston-based private equity firm Fireman Capital Partners, a move that has since kick-started an era of exponential growth and dizzying development for both labels. Squatters Craft Beers and Wasatch Beers are now available in 15 states and combined have won 17 World Beer Cup awards, a number surpassed by only two other top-50 craft brewers in the US. 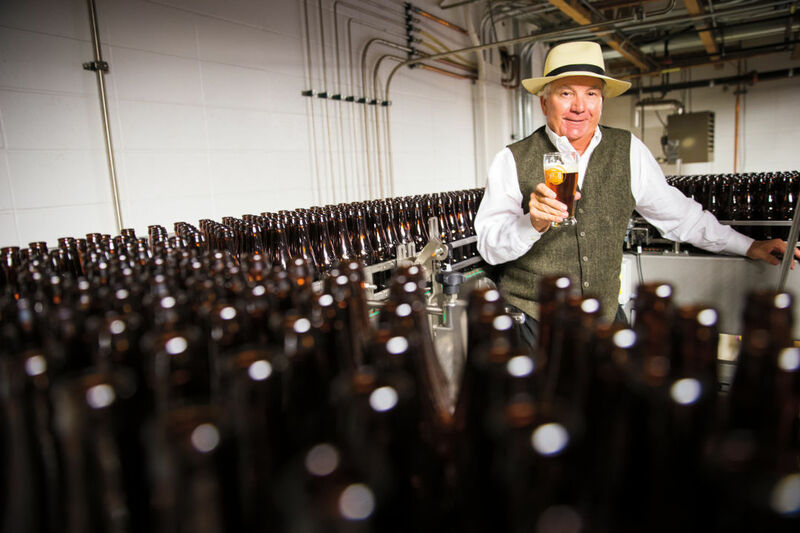 Beer production at the Utah Brewers Cooperative is at an all-time high, with an estimated 55,000 barrels—or more than 18 million bottles—scheduled for production this year alone. Packaging operates seven days a week, and employees now number more than 500. Under the larger corporate umbrella of the Salt Lake Brewing Company, Squatters and Wasatch also operate five high-volume brewpubs in Salt Lake City and Park City, and, according to Schirf, they’re looking to expand their “pay tasting” model outside of Utah. Cole and Schirf are tight-lipped on where the next Squatters or Wasatch brewpub might be, but beer sales are reportedly strong in Colorado, Texas, and Nevada. New Executive Chef Shane Baird, whose fine-dining background includes the St. Regis’s J&G Grill, recently overhauled menus at all Salt Lake Brewing Company brewpubs, lending a heightened level of finesse to the dependable fare. “It’s about great ingredients prepared in simple, rustic, nurturing ways,” Cole says. Additional Cooperative goals include launching new beers and grabbing even more craft-brewing market share, which Schirf says has grown from less than 1 percent of the overall beer market when he first started to 17 percent today. While the two brands operate under the same corporate entity, a large part of Squatters and Wasatch’s new business strategy has been deepening their individual appeal. The rebranding process has been “scary” according to Cole, but one that strengthens the individual identities of the labels over the long haul. Squatters Craft Beers’s new packaging reflects an old-fashioned aesthetic that Schirf describes as “refined and dignified,” epitomized by black and white photographs on tan labels. Wasatch Beers’s new look consists of bold line drawings against a striking black background. “Irreverent like me,” says Schirf. The roles played by Schirf, Cole, and Polychronis within the Utah Brewers Cooperative have changed as well. Schirf is company president, overseeing the Cooperative’s brewery operations, Cole sits on the board of directors with Schirf, and Polychronis has retired.